Epimedium is a sort of the long-term herbs of the family of Berberidaceae, growing in various countries of East hemisphere. In Western Europe this plant often call "a flower of elves", and in England there is not less interesting name – "the archbishop's cap". In the Russian-speaking countries the plant name got accustomed more, most likely, in view of the fact that this plant in the wild nature grows mainly in mountain districts. Epimedium has the creeping root located close to a soil surface, very attractive rassechenny with teeth at the edges the leaves which are settling down on scapes (15-45 cm) and often replacing habitual green coloring with a crimson or red shade, and the interesting small flowers (to 2,5 cm in the diameter) various coloring blossoming, as a rule, in May. Some grades sometimes repeatedly blossom also in the summer. The fruit represents a two-fold box with small seeds. Many types of Epimedium have evergreen leaves, however these representatives are less frost-resistant and in our strip demand shelter. Already for a long time in the Chinese medicine Epimedium's leaves as medicine for diseases of kidneys, joints are used, and also at sleeplessness and nervous breakdowns. Epimedium. 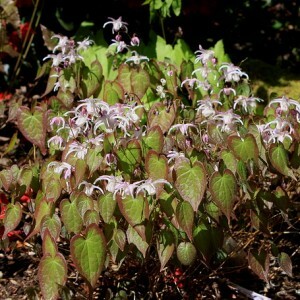 Epimedium variety. Epimedium cultivation.